Critical thinking skills can be developed in mobile learning in part because of the "extreme situatedness" of the learning. Situated learning, which ties together experience, context, backgrounds, and the concepts, helps learners develop a concrete idea of what the general course concepts are about and how to use the knowledge. Situated learning, with is often connected with experiential learning, is very effective when the concepts are presented in an "authentic" environment, and where there are opportunities for collaborative, interactive, social learning. Mobile devices can be ideal because they can allow individuals to bring the content into the context. They can also allow students to interact with each other in synchronous or asynchronous ways, and to bring their unique context / setting / situation to the collaborative learning space. For example, they can take pictures and report on unique settings and share their findings in a common learning space (discussion board, blog, etc.). 1. Extreme situatedness. Learners who are learning about nature can actually bring their course into nature. For example, if they are learning about igneous rocks, they can take their mobile devices to a lava field, record the GPS coordinates, take photographs, and record an audio file. They can then post the text, the image, and the audio in a shared space. Individuals can then respond. 2. Case studies and extrapolating consequences through causal chains. Students are able to studies cases that they can relate to the content. They can also propose alternative outcomes, or discuss other scenarios. It is useful to extrapolate consequences, which allows students to develop their ability to develop cause-and-effect arguments. 3. Connecting the unconnected. Students can be asked to make connections and brainstorm. They can then share the brainstorms, or, even better, collaborate in brainstorming activities. This is very effective, especially via text messages. If individuals are not able to post, they can type up a brainstorming activity and e-mail or mail (via regular mail) to their instructors. Using mobile devices in all conditions is key to the success of this approach. 4. Collaborations. Students can collect, record, and share information easily. It can be real-time (as in instant messages, video-chat, or voice-over-telephony). They can also e-mail each other or post images / data collected in their various locations. For example, they may be studying pond scum. They can e-mail each other photos of ponds they encounter. 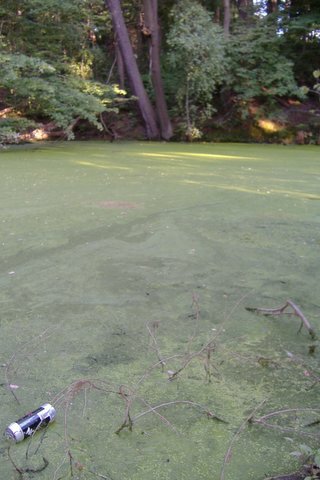 This one is of a pond in upstate New York.